In cherished novels such as Kitchen and Goodbye Tsugumi, Banana Yoshimoto’s warm, witty, and heartfelt depictions of the lives of young Japanese have earned her international acclaim and best-seller status. Her insightful, spare vision returns in two novellas possessed by the ghosts of love found and lost. In Hardboiled, the unnamed narrator is hiking in the mountains on an anniversary she has forgotten about, the anniversary of her ex-lover’s death. As she nears her hotelstopping on the way at a hillside shrine and a strange soba shopa sense of haunting falls over her. Perhaps these eerie events will help her make peace with her loss. 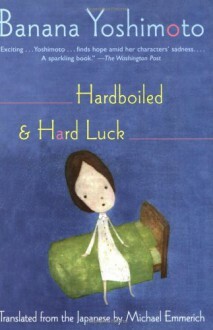 Hard Luck is about another young woman, whose sister is dying and lies in a coma. Kuni’s fiancé left her after the accident, but his brother Sakai continues to visit, and the two of them gradually grow closer as they make peace with the impending loss of their loved one. Yoshimoto’s voice is clear, assured, and deeply moving, displaying again why she is one of Japan’s, and the world’s, most beloved writers. Sad yet touching. I love reading Ms. Yoshimoto's work. It always feels like I'm home. Not a big fan of the translator.